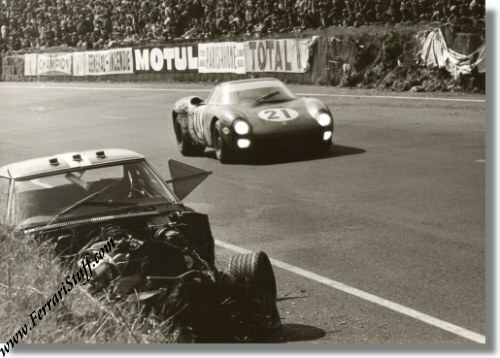 This is a vintage 1968 photo of the David Piper / Richard Attwood Ferrari 250 LM en route to 7th. place overall during the 1968 running of the 24 Hours of Le Mans. In the foreground it shows the crashed # 4 Chevrolet Corvette of Jean-Michel Giorgi and Sylvain Garant. The Ferrari is question is Ferrari 250LM S/N 8165 which still remains with David Piper. The photo measures approximately 9 x 6.5 inches.